Peru, as the host country for this year's meetings of the Asia-Pacific Economic Cooperation (APEC), is setting high expectations for the 21-member bloc, pushing for an agenda to improve the quality of life and connectivity within the region. 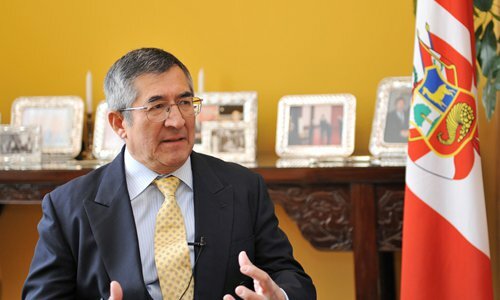 The meetings to be held in Lima from November 19 to 20 will be focused on boosting small and medium-sized enterprises (SMEs) as well as trade and investment cooperation among member economies, along with other topics such as food security and climate change, Peruvian Ambassador to China Juan Carlos Capunay told the Global Times in an interview on Monday. He said one of the main outcomes of this year's meetings could be the conclusion of the study of a roadmap to a Free Trade Area of the Asia-Pacific (FTAAP). Capunay also said China can play a huge role within the region, offering its experience in achieving fast growth as well as a vast market for consumer goods, and trade and investment opportunities. Any regional free trade arrangement cannot leave China out, he said. On China-Peru relations, Capunay hailed the relationship as one of the highest level, with China being the largest trading partner of Peru in many areas and the largest investor in mining, fishery and agriculture. GT: What is the core agenda Peru is pushing for in this year's APEC Summit? Capunay: What we have in mind is that APEC 2016 has to talk about the quality of life and then connectivity. When we talk about the quality of life, we have to talk about different aspects or factors that will contribute to improving the quality of life of the people of the Asia-Pacific. One of them is SMEs. SMEs in Asia-Pacific economies represent almost 95 percent of industrial capacity and 97 percent of the population in terms of employment. We have to establish a network to facilitate trade and transactions. And to promote the development of our economies, we need to have a connectivity system in terms of trade and interdependence. What I mean is an FTA. In 2014, the APEC leaders determined a study on the pathway to the FTAAP has to be approved this year. In 2016, out of nine chapters of the study, we have already approved eight. So we have almost concluded the roadmap for the FTAAP. That could be the main outcome of the APEC 2016. We are quite close to this initiative. We hope that by 2020, we will be able to [reach the final agreements]. GT: What kind of role does China play at the APEC? Capunay: We cannot foresee any regional agreements without China, our main trading partner and the main trading partner of many APEC members, especially in Asia and Latin America. China is playing the very important role as the main market for many products. Also, China can play a very important role in the investment area. China could be, in my own opinion, the only economy that has [the capability] for investments overseas. You look at any other economy, it is facing a deficit and some economic problems. Every economy of the Asia-Pacific comes to China for investment, comes to China for trade. That's the role China can play. GT: How would you describe the current state of China-Peru relations? Capunay: I'm very happy with the level we've reached in our relationship. This year, we are celebrating 45 years of our relationship. In 45 years, we have been working together in order to set the foundation for very solid, transparent and honest friendship and cooperation. China has three main instruments for dealing with its relationships with other countries: one is an FTA, another is a strategic partnership, and the third is a committee on economic and strategic dialogue. Peru is the only country from Latin America that has the three instruments. In terms of our FTA, China is our first trading partner. Day by day, the structure of the trade is changing. And little by little, we are increasing that trade. In terms of investment, China is the largest investor in mining, fishery and agriculture. In terms of the comprehensive strategic partnership, what we have developed today is a dialogue at the highest level. We have selected four areas for investment: energy, mining, infrastructure and production capacity. That's what we will be focused on.